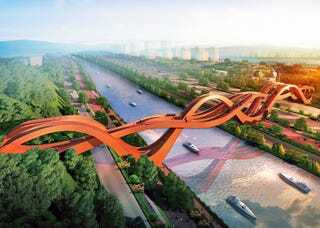 Soon, the planned community of the Meixi Lake District in Changsha, China will be graced by a bridge modeled after the legendary mathematical concept of the Möbius strip. The Mobius strip is a surface with only one side, often modeled by twisting a long, rectangular piece of paper and attaching both its ends. NEXT Architects just won first place in a design competition with plans for a sinuous pedestrian bridge in Changsha, China . . . The bridge is designed for a site in the city's Meixi Lake District, and it provides multiple pathways across the Dragon King Harbor River. The bridge connects the river park with the rest of the site's ecological programs, and it's a critical project in the development of the district. Construction of the bridge, and the city planned for it, begin in 2014.